"Today is the triumph of grace in the life of our sister. She is giving herself, consecrating herself in a public act of worship in the Church, for the Church, to Christ” - Fr John Harris OP. The Dominican Sisters in Drogheda marked the World Day for Consecrated Life this year, with the Solemn Profession of Sr Mary Cathy Howard OP. 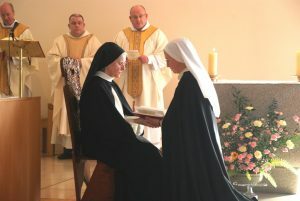 A native of Finglas in Dublin, Sr Mary Cathy made her profession in the hands of the Dominican prioress, Sr Mary Breda Carroll, at the Monastery of St Catherine of Siena in Drogheda, in the presence of representatives of the wider Dominican family, as well as her family and friends. Fr Eamonn McCarthy, director of Radio Maria Ireland, and a priest of Cloyne Diocese, who is a close friend of Sr Mary Cathy, was one of the chief concelebrants at the Eucharist along with 16 other Dominican friars. Fr Gerard Dunne OP presided and was joined by Fr Gregory Carroll, Provincial, and Fr John Harris who preached the homily. Sr Marie Redmond OP, novice mistress of the Cabra Congregation of Dominican Sisters attended with two novices. In his homily, Fr Harris said the profession marked “a phenomenal flowering, a maturing of Sr Mary Cathy’s journey of faith”. The Dominican nuns, who live a life centred on prayer and adoration of the Eucharist, are the only community of contemplative Dominican nuns in Ireland.